We got some really fun new Chibi Kids to share with you today! Annie is available in the store NOW along with the other 2 stamps we show you this week!! We hope you enjoyed our December release! All the new stamps are available NOW in the store! I colored up this darling Lucille with my Copic Markers and paired her with some American Crafts Christmas-themed paper I had in my stash. I just love this sentiment (included in the stamp set!) - it's SOOOOO cute with her little reindeer cap! Lucille is available in the store Today along with the other 2 stamps we show you this week!! We hope you enjoyed our third and final day of our November release! Be sure to check out what the rest of the design team created with this image over at the Stamp Anniething Blog! All of the new stamps are available RIGHT NOW in the store! Be sure to head over there and check them out! Stamp Anniething July Theme Week Day #3! Time for a smile.. its all about RAINBOWS... Simply use rainbow colors and themes! 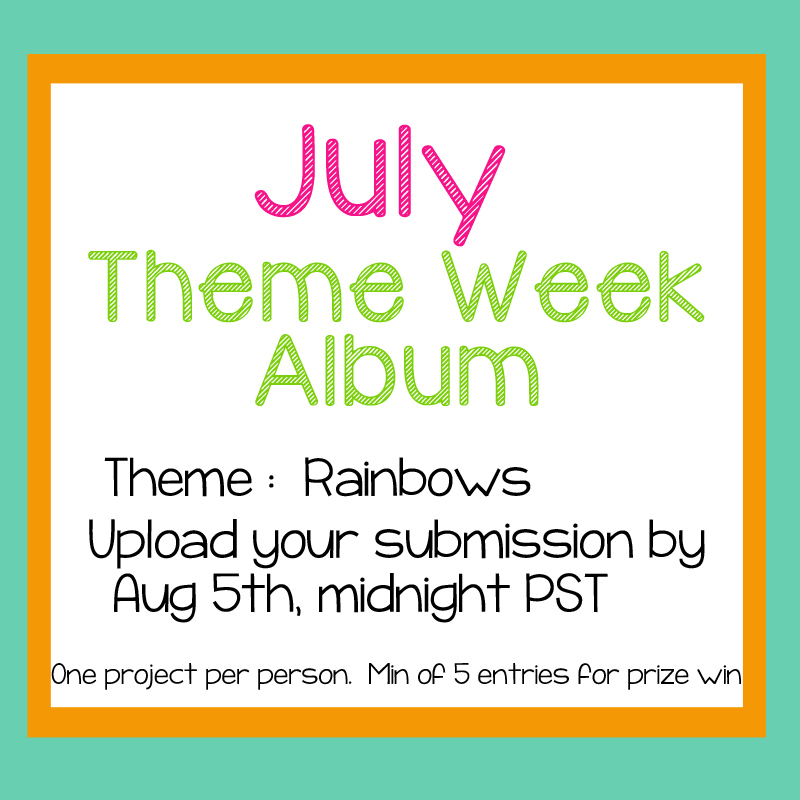 So here we go for July's Theme Week! 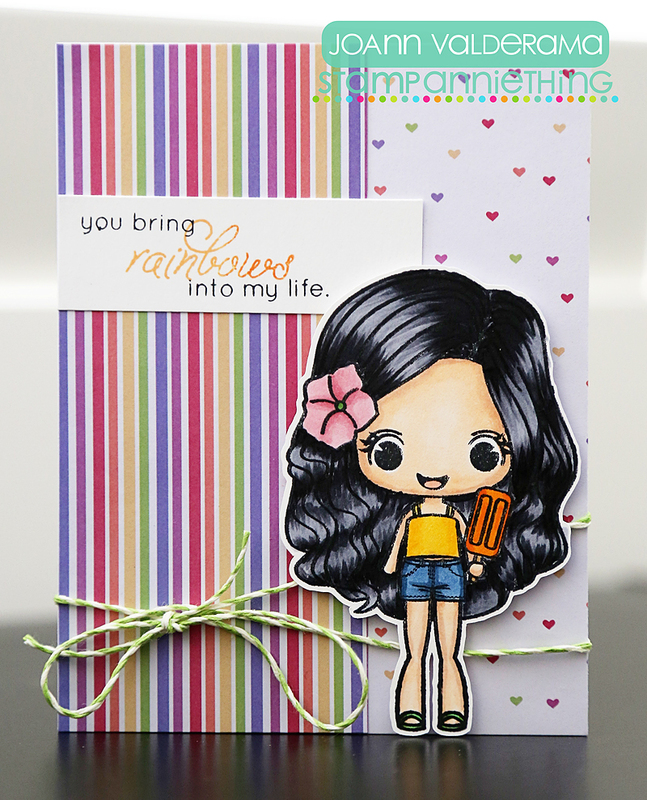 JoAnn from JoBoogie Stamping here with a fun card for Rainbow Week! Here's what I created to share with you today! I paired her up with some fun rainbow themed patterned paper I had in my stash and used a sentiment that included "rainbows" in it and used some Hero Arts Ombre ink too. Clever, don't you think? I love love LOVE how my card turned out and I hope you did too! Thanks so much for stopping by! 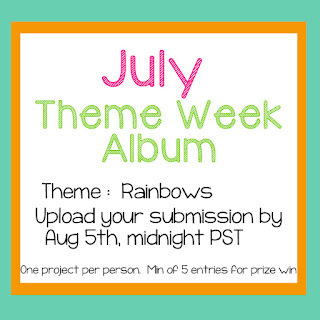 Be sure to come back tomorrow for more Rainbow Theme Week fun! Stamp Anniething July Release Day #3: Abigail! Sweet Abigail is ready to Hula Hoop into your heart! Abigail is available in the store NOW along with the other 2 stamps we showed you this week!! Isn't she so cute?! I colored her up with my Copics to match this Echo Park patterned paper I had on hand. For her sentiment, I opted to use a greeting from the Scrappy Moms Stamps "Walking On Sunshine" stamp set. I figure this card would be great for any upcoming birthdays or even just to cheer a friend up! Thanks so much for stopping by today! Be sure to check out the Stamp Anniething blog for more fun inspiration using Abigail! Stamp Anniething July Release Day #2: Kelly! Summer is the perfect time to catch up with your favorite books! Kelly will be available in the store Friday along with the other 2 stamps we're showing you this week!! Here is the project I made with the Kelly! Thanks so much for stopping by today! Be sure to check out the Stamp Anniething blog and see what the rest of the design team has in store for you! Stamp Anniething + Scrappy Moms Stamps: Wishing You a Day as Special as You! I'm back with a new card I created for this week's post over at the Stamp Anniething blog! This week I'm using one of this month's new release stamps, Liberty - Sweetie Pie! I love cooking, baking, and EATING (LOL) so this month's release was extra fun for me. I decided to color Liberty up with my Copic markers and pair her with some Jillibean Soup patterned paper I had in my stash. I love how it turned out - and it was so easy! Of course I had to pair her up with my latest stamp set from Scrappy Moms Stamps! And it's with a heavy heart I have to announce that Mel and Tammy from Scrappy Moms Stamps have decided to close up shop and this is the last stamp set they will produce. So if you've been eyeing any stamp sets from SMS, I suggest you run there NOW! Scrappy Moms Stamps will always have a special place in my heart as it's one of my very favorite teams to have ever worked on. And the stamps themselves always kept my creativity flowing - they worked so well with not only the images I colored with my Copics, but also pushed me creatively to use my Cricut and Silhouette more. Thank you Mel & Tammy for letting me be a part of the SMS family. I will forever be grateful! Be sure to check out my blog post over at the Stamp Anniething blog! Thank you for stopping by! Scrappy Moms Stamps TTC: Lucky You! It's Tuesday and it's time for a new Terrific Tuesday Challenge over at Scrappy Moms Stamps! This week's challenge is LUCKY YOU - so get in the the mood for St. Patrick's Day and use a shamrock or create a lucky (or good luck) card! I decided to use my Cricut Explore and found this adorable leprechaun in Design Space (I have the cartridge, I think it's from Simply Charmed). I thought it would be great to give it as much shimmer as I could so I used a lot of glitter paper and some shiny patterned paper I picked up from Hobby Lobby. This cutie is also set on an Action Wobble (get yours HERE!) and I finished it off with the "good luck" sentiment from the More Mini Messages sentiments set. I just LOVE how this card came out! Hope you enjoyed my project today! Have a wonderful week! It's WEDNESDAY and I'm back with another card I created for the Stamp Anniething blog! Today I'm using one of the newest releases (just released last week, btw. #justsaying LOL). Meet (again) Danielle - Springtime! So for my card today, I really wanted to color her up in teals and navy, two of my favorite colors when using my Copic Markers. I found this American Crafts patterned paper in my stash and knew it would be perfect! I just added the Lawn Fawn twine and an enamel dot I had in my stash and BOOM I was done! Scrappy Moms Stamps TTC: Cute as a Bug! It's TUESDAY and time for another Terrific Tuesday Challenge over at Scrappy Moms Stamps! This week our challenge is "Cute as a Bug!" So break out those insect and buggy images and start creating! Thanks so much for stopping by today! Be sure to check out everyone the Scrappy Moms Stamps blog and their creations! Hope you join our challenge! We can't wait to see what you create! Scrappy Moms Stamps TTC: Out of This World! It's another Tuesday and it's time for another Terrific Tuesday Challenge over at Scrappy Moms Stamps! This week our challenge is OUT OF THIS WORLD so show us your outer space, alien, extra-terrestrial etc. projects! Anywho, I still know a bit about it, and BB8! Isn't this cut file from Lettering Delights so CUTE?! When I saw him, I had to have him. And I KNEW he'd be perfect for this week's Out of this World challenge. I paired him up with a sentiment from the new Out of this World set from Scrappy Moms stamps and used a bit of my favorite October Afternoon Rocket Age paper (I'm glad most of you know what I'm talking about when I say I LOVE this paper pad! Super simple card and one 8 year old we know just absolutely loved it. Thanks so much for stopping by today! Have a wonderful week!